We are starting a new edition of BM#53 and I will be blogging about easy Movie Snacks. Movie snacks for ages have always been popcorn and in recent times we have moved puffs and cream buns when we go out to cinemas. However at home, its always lays chips for the kids. I don’t normally get them those potato chips and only allowed during travelling. They have got into the habit of getting these now when we watch a movie at home. Fridays are mostly a movie night at home, sometimes we end up watching on Saturdays as well since the kids vacation. My kids are quite fussy and won’t like anything elaborate, they are fine with Lays chips and a fuzz. This time I wanted to experiment with something new and this Easy Pizza cups worked out so well. The 4 ingredient Pizza Sauce, the toppings are made ahead and all you need is about 5 – 7 mins break to get these done. Check out the Cauliflower Tempura, that also makes a great Movie snack, if you give yourself some 10 mins break. 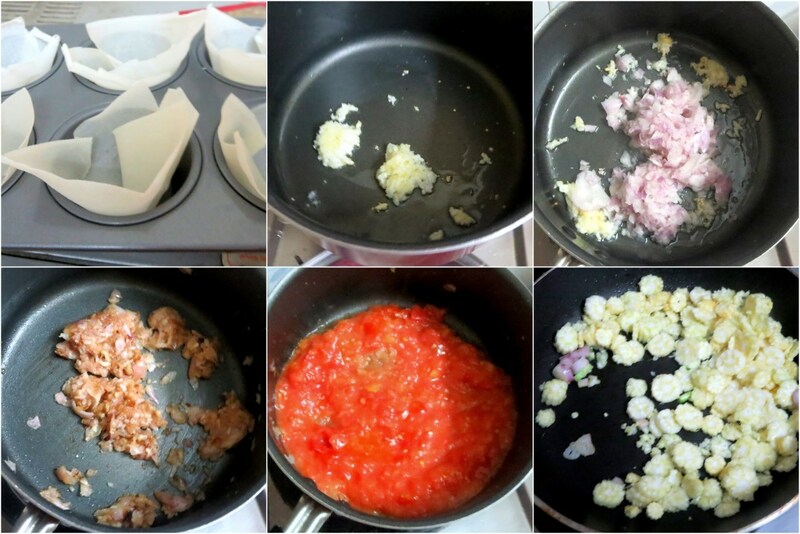 Heat a non stick pan with olive oil, saute the minced garlic, then add the minced onions, saute well till it browns. 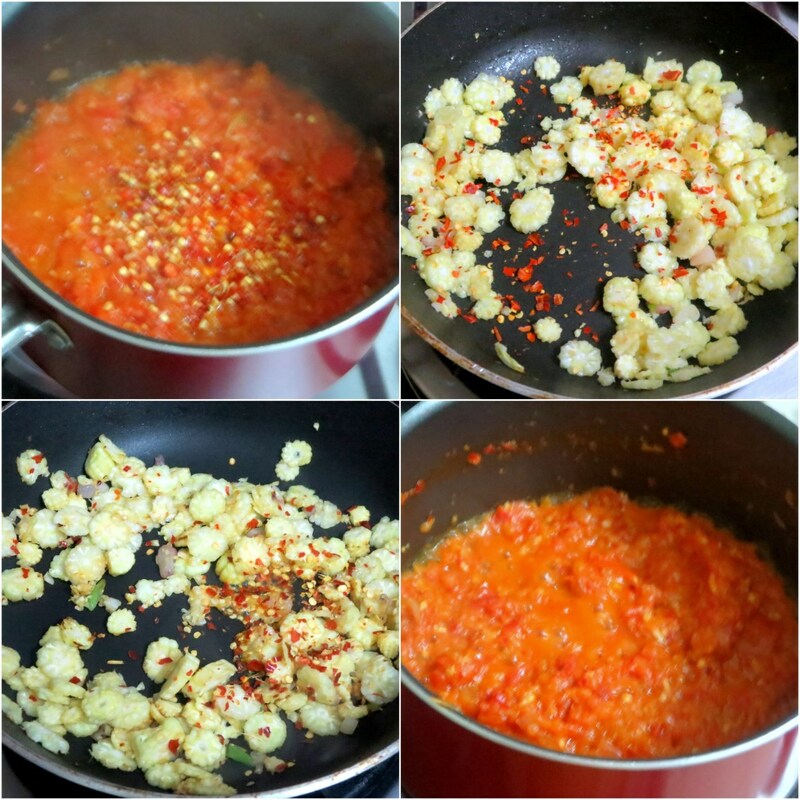 Then add the tomato puree, salt and red chili flakes, let it get cooked till done. Saute a pan with butter, add spring onions, finely chopped baby corns till it turns soft. Season with salt and red chili flakes. Pre heat oven at 185 C.
Line a muffin tray with wonton sheets and bake the wonton sheets for 5 mins. Remove the wonton sheets, add the tomato sauce, Then top with corns, mozzarella cheese, spring onion grees, red chili flakes, italian seasoning. Bake for 4 -5 mins till the cheese melts. 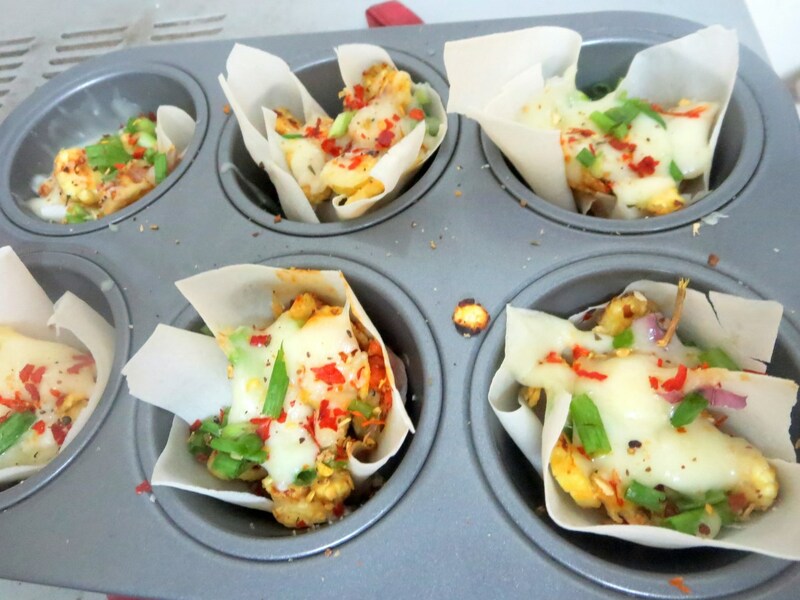 Wonton pizza cups look great. Nice idea to use those for the base. 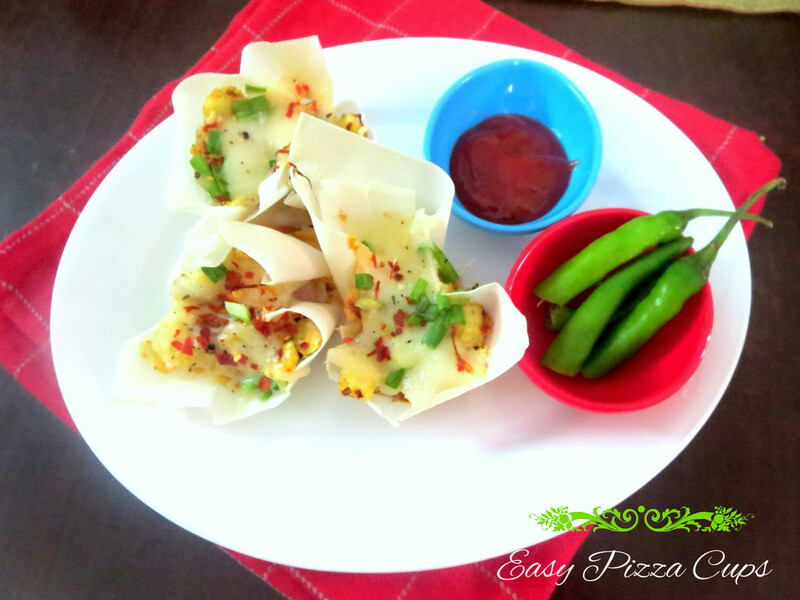 Wonton sheets is a super idea , must try this Valli! Valli I have samosa sheets will that work? Archana, I am sure those samosa sheets will work as well!..do try and let me knwo. We have to come up with innovative recipes like this to keep the kids entertained through entertainment! 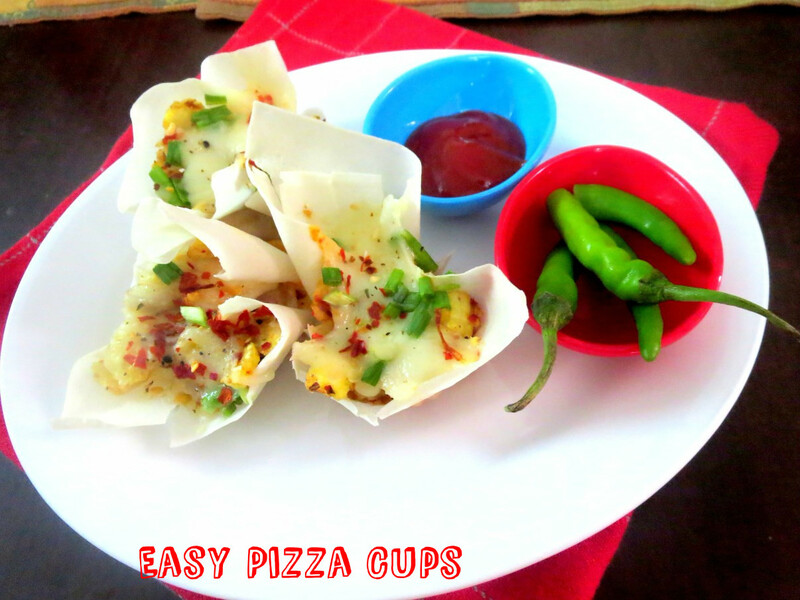 Nice one, the pizza cups..
pizza cups looks great..would like to have them for our movie nights..
Wonton sheets as a pizza base is interesting and guess your kids were well entertained with the movie and snack as well. Thats truly an interesting pizza cups, brilliant Valli. Pizza cups look awesome. Nice recipe.Sure kids will love it. Such a neat idea. Portable and mess free. Perfect for the movies. Usage of Wonton wrappers is very interesting. What a yummy treat. Love the use of wonton wrappers to make the cups. Great idea valli!! Definitely a big hit with kids!! What an idea!!! Looks like a delicious storm in a cup!